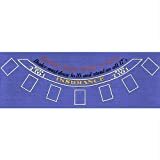 10-3010BLUE Features: -Blackjack felt.-Layout for the popular casino game blackjack or 21.-Easily be stapled to a homemade table.-Used as a folding blackjack table for parties. Color/Finish: -Color: Blue. Dimensions: -Dimensions: 36” H x 72” W x 0.